As most of you know, you can switch between the visual location entry, and the text based one in Nautilus, by hitting Ctrl+L. I can still switch between the two via the Ctrl+L, but I'm stumped about the fix. To permanently switch from path bar to location bar, you can use dconf-tools . After installing it, search for dconf-tools in the dash and open it. 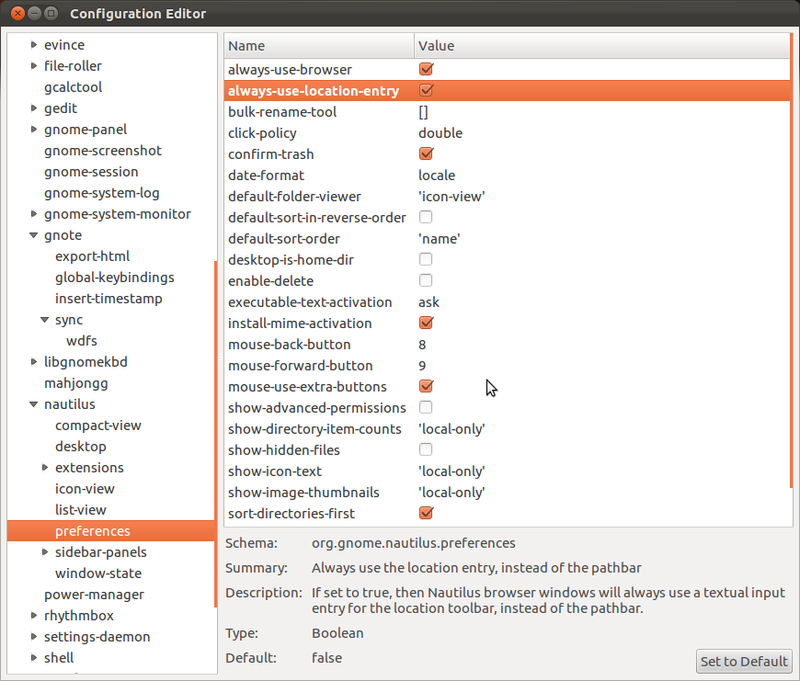 From there, the setting is located at org -> gnome -> nautilus -> preferences. You need to enable always-use-location-entry to always use the location toolbar instead of the path bar. This setting is user based. You may need to restart Nautilus with nautilus -q. Not the answer you're looking for? Browse other questions tagged nautilus gconf preferences or ask your own question. How do I quickly navigate to a full path using the “Files” program? Is it possible to enable adress bar in Nautilus on Ubuntu 18.04? Full directory path instead of graphical navigation? How do I configure “initiate_all_edge” for compiz? How do I adjust my window buttons to the left or right? How do I switch back from location bar to path bar? Nautilus: Make “Show folders before files” option persist?